On December 26th we celebrated the feast of St. Stephen, the first martyr of the Church. When I read the gospel for the feast day, a particular line stuck out in my mind. It caused me to consider what might precipitate a conversion of heart. The setting for the gospel on St. Stephen’s feast day had him dragged outside of the city’s gates after his inspired defense of the faith infuriated the Sanhedrin members. It’s that second sentence that mentions Saul which really piqued my curiosity. 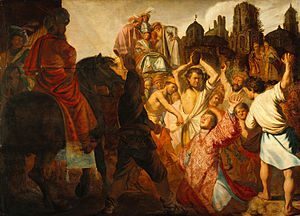 On the day that Stephen was stoned to death, Saul of Tarsus was a violent persecutor of early Christians. A young man, Saul stood by willingly and watched as men relentlessly pummeled Stephen with stones until the life drained from his broken body. 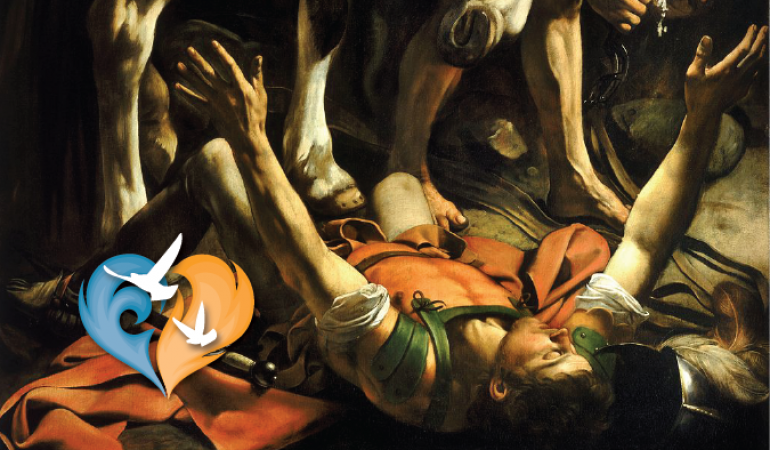 With this picture in mind, how was it that Saul converted to become St. Paul, perhaps the most influential of all of the saints? Of course, we know the rest of his story. Saul eventually traveled to Damascus, where he planned to incite more trouble, but en route he was knocked to the ground by a bright light and heard the voice of Jesus. Temporarily blinded, Saul followed Jesus’ command to go into the city and within a matter of days he was converted, baptized and spent the rest of his earthly life as Paul, a zealous promoter of the Church. I suppose we could conclude that Saul’s conversion was the direct result of his personal experience with Jesus on that roadway, but many people heard Jesus speak and witnessed His miracles firsthand before His death and resurrection and yet they remained unmoved in their opinions. So what is the catalyst for conversion? How does Christ reach a seemingly closed heart? Does it always require an extraordinary supernatural act to draw a person closer to Jesus? Speaking with former attendees of Ignited by Truth Catholic Conferences, I’ve concluded that extraordinary acts of conversion are still happening in our day and age. Sauls are still becoming Pauls, but the circumstances don’t necessarily look out of the ordinary. Take for example David and Jenny, a husband and wife who’ve been attending IBT since 2009 (he a cradle Catholic, she a convert). From the beginning, the conferences felt natural to them. They were already active members in their parish, who regularly read books on the faith. But a 2010 talk by Dr. Bergsma, entitled “My Journey to the Catholic Church”, inspired them to go deeper. David and Jenny took a chance and bought Dr. Bergsma’s college course on CD that they found in the vendor area. They listened to it with friends and fell in love with scripture and scriptural studies. Then, during one of the get-togethers, their friend asked David if he’d ever considered becoming a deacon. That question stuck and now David has started the process for the diaconate in the Diocese of Raleigh. And then there’s John and Melissa. After having four children in four years, they were weary. 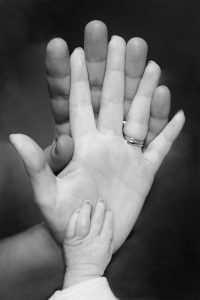 The prospect of having more children seemed unavoidable and was placing undue strain on their marriage. Though Melissa knew the Church’s stance on sterilization, she decided to undergo a tubal ligation to save her marriage. She knew that if their circumstances ever changed she’d be willing to have her procedure reversed, but she didn’t foresee the likelihood of John ever changing his mind. While attending one of the first Ignited by Truth Conferences, John and Melissa heard Steve Wood‘s talk. In the course of his presentation, Mr. Wood said if a marriage isn’t open to life, God cannot bless the marriage. A simple statement, it had a profound effect. The next day as Melissa was stepping out of the shower, John asked, “Can we reverse that?” He never even mentioned what “that” was. They both knew. Melissa underwent a successful reversal of her tubal ligation and they were eventually blessed with one more child, who is the delight of his older siblings. God used Steve Wood’s presentation to touch John’s heart and invite the couple to open themselves up to His creativity. God inspired David and Jenny to grow deeper in their faith through the works of Dr. Bergsma. This prepared David to hear the call to serve God’s Church in a new way. Clearly, not every conversion requires a booming voice from the heavens or a blinding light to knock us off of our current path. But conversion does generally involve a catalyst, a spark, that ignites our hearts and/or minds to reconsider the road we are traveling down and to where it leads. This February 24th and 25th come and get ignited. Come to learn. Come to experience. Come to be inspired. Come and hear what God has in store for you! All testimonies are true but names have been changed to respect the privacy of individuals.